This week the Mets locked up Todd Frazier for 2 years, $17 million in an especially slow free agent market. In many ways Frazier is the classic modern player with an “all or nothing” approach at the plate and stellar defense at third base. I’m not sure if this spells the end of the line for the Captain David Wright. But it certainly adds a lot of stability to the infield for 2018-19. Without knowing what Wright has left, the Mets have been in a quandary about moving forward without him or not. It appears that Sandy Alderson decided to take the middle ground and sign a short-term solution at third base. Ken Davidoff has a good article in the NY Post this morning about how the Mets and David Wright may part ways. Sadly, it’s been looking more and more like the back, neck, and shoulder surgeries over the past three seasons have ended David’s career. He still plans to show up in a couple of weeks to Port St. Lucie but he hasn’t thrown a baseball in recent memory. It’s tough to see a hobbled David Wright and “old” Jose Reyes for those of us that reveled in their heyday of the 2000’s and thought that 2006 was “the year” only to fall short to the Cardinals. Wright still has three more years on his contract. The most likely outcome in my opinion is that he won’t play again and he’ll spend the next 30 years doing media work and making a living “being David Wright” like Keith Hernandez, Ron Darling, Bobby Ojeda, and others. Multiple media reports state that Mets ace Johan Santana had an MRI on his shoulder today that indicated a probable re-tear of his surgically repaired shoulder capsule. In all likelihood, Santana’s season is over and so is his Mets career. Santana will finish his Mets career pitching in four seasons to a 46-34 record with a 3.18 ERA over 109 games. The injuries were a huge disappointment but we’ll never forget the 2012 no-hitter with the game saving catch by Mike Baxter. The Wilpons must be kicking themselves now for not insuring Santana’s contract against injury. At least this is the last season of the contract. They’ll be finished with Santana after this season on the disabled list. Several media sources are reporting that David Wright may start the 2013 season on the disabled list. He suffered a muscle strain in his ribs while participating in the World Baseball Classic this week. This is really a team’s worst nightmare about the WBC. The face of your franchise gets hurt in an exhibition away from the team and misses time during the regular season. I’m not a fan of the WBC anyway, but this makes me even less so. Granted, and injury like this could happen anytime even if Wright was with the Mets. But I have to say that having the WBC games during spring training is the wrong time. Players generally aren’t ready to go all out in the beginning of March. They need more time to get ready and now the Mets are paying the price. Everyone that bought opening day tickets expecting to see Wright looks like their out of luck this year. What a shame. Mike Baxter is making his return with the Mets after separating his collarbone on June 1st preserving Johan Santana’s no-hitter. He’ll re-join the team in San Francisco starting tomorrow at 10:15pm. It’ll certainly be a triumphant return for the Queens native. I wish he had been able to play his first game at Citi Field. The crowd would’ve gone crazy for him. 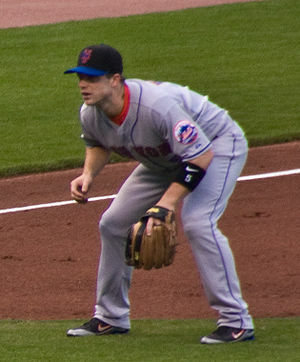 Unfortunately, Kirk Nieuwenhuis was exposed by opposing pitchers after having a great start with the Mets. He’s currently hitting .252 with 7 HR’s and 28 RBI’s. The problem was 98 strikeouts in 282 at-bats. It’s possible that Baxter could play left field predominantly against right-handers with Jason Bay playing against lefties. If Bay continues to struggle and Baxter keeps hitting, Baxter may be able to get a grip on the left field job permanently. Jason Bay’s career has continued it’s steep decline this year. There have been calls from fans for two and a half years to keep Bay out of the lineup so he can’t continue to damage the Mets. Now that Mike Baxter is playing at Buffalo in rehab games, that possibility could become a reality sooner than later. Baxter’s been on the disabled list since June 1st, when he made that great catch in left field preserving Johan Santana’s no-hitter. But he dislocated his collarbone in the process and ended up losing two months of the season. Let’s face it, Bay has less than a year and a half on his contract with the Mets. He’s hitting .170/.246/.330 right now and there’s no prospect of improvement on the horizon. As the money left on his contract becomes smaller and smaller, the need to continue to try to get something out of him is reduced. I’m not sure that Baxter is a long-term solution in left field as en everyday player, but I like the energy and effort he has on the field. And in 40 games (74 PA’s), he’s hitting .323/.392/.523. More than respectable! And when he did get a chance to play, he seemed to be in the middle of every rally. Not killing rallies like Bay has for nearly three seasons, when he’s been healthy enough to play. I’m all for giving Baxter a shot to hold onto left field as the primary starter with Bay playing occasionally against lefties.